The ruble has fallen by more than 25 percent against the dollar since January. According to analysts, the main reason is the continuing decline in oil prices. However, the Russian authorities also benefit from a depreciated ruble because it will reduce the country’s potential budget deficit. Since the beginning of 2014, the Russian ruble has plummeted by more than 25 percent against the dollar. Market players blame persistently declining oil prices for the ruble’s depreciation. “At the current time, the key factors facilitating the weakening of the Russian currency are falling prices for oil and other raw material assets,” said Anton Soroko, an analyst at investment holding Finam, who explains that Brent crude has now dipped below $87 per barrel, whereas it cost around $115 in the middle of summer. This process is occurring against the backdrop of aggressive growth by the dollar not only against the ruble, but also against the Japanese yen, the Swiss franc, the euro, and other currencies, Soroko said. “Growth in the dollar primarily reflects a shortage of the currency on the market in connection with growing demand. The decline in oil prices is the main indicator, but it is also at work at the level of expectation, because investors fear a decline in export revenue in Russia,” said Mikhail Khromov, a research fellow at the Institute of Applied Economic Research at the Russian Presidential Academy of the National Economy and Public Administration. According to Khromov, the second factor influencing the ruble is the lack of foreign capital flowing into Russia because of the sanctions and geopolitical instability. Chief analyst at UFS IC Alexei Kozlov said that according to the European Central Bank’s monthly report for October, Europe is losing its economic growth impulse, and inflation has fallen to critical levels, which puts the European currency union at risk of recession. “Amid significant growth in risks, amid a strengthening dollar and falling oil prices, the ruble and the Russian stock market are experiencing major pressure,” said Kozlov. In response to the falling ruble, the Russian Central Bank performed more than $5 billion worth of market interventions at the beginning of October. 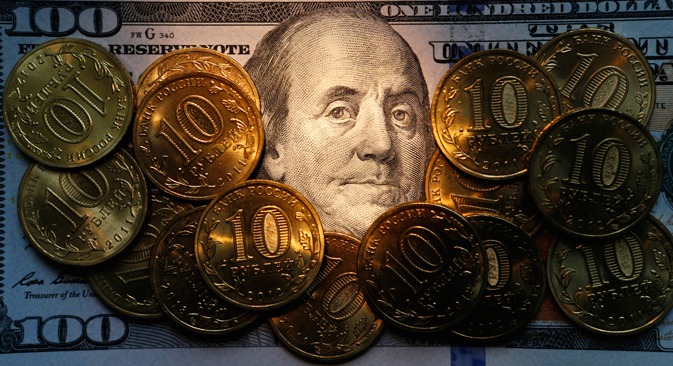 The regulator is selling dollars to support the ruble and reduce demand for foreign currency. “Therefore, at this point the regulator is just smoothing out market fluctuations but not attempting to stop the current downward trend in the Russian currency,” said Kozlov. It was originally assumed that the Russian ruble would make the transition to float freely, but because of pressure on the national currency the Central Bank was forced to return to the market, albeit with smaller-scale interventions. However, there are some advantages to the situation. The Russian authorities benefit from a weaker ruble because it will reduce the country’s potential budget deficit. According to Soroko, a weaker ruble has a positive impact on the budget because it helps compensate for falling revenues from oil and gas sales. The majority of hydrocarbons are sold for dollars and euro, while the Russian budget is set in rubles. A weaker ruble will also provide Russian producers with more advantageous conditions, because the cost of imports grow as a result, allowing Russian companies to successfully compete with foreign producers. “The average oil price in annualized terms will remain above $96 per barrel (the Russian budget is based on that price), because the price was $106 for August, and even if oil costs $85 by year’s end, the average price will still be $100 for the year, which doesn’t pose any risks to the budget,” said Mikhail Khromov. Alexei Kozlov, meanwhile, said it would be impossible to constrain the ruble by simply investing in making the Russian economy attractive and thereby stopping capital outflow. “The Russian economy is currently very dependent on oil prices, economic growth rates, and inflation. If these components are brought back to normal, the Russian currency can also stabilize,” he said. Oil prices, which have just started to gradually recover, may also boost the Russian currency. According to Bloomberg, oil prices started to rise on Oct. 20 when it was reported that Iran is attempting to undertake measures to prevent further drops in prices. Furthermore, Saudi Arabia and Kuwait have decided to decrease production at the Khafji field, located in a neutral zone between the two states. As a result, December futures for Brent crude grew to $90.21 per barrel.